This guitar lesson will teach you how to play one of the first songs of the now iconic band, Maroon 5. I really like the guitar part to this song, since despite the fact that it is a soft rock song, it incorporates bosa nova, a genre of Brazilian music. You’ll be using 4 chords in this song, but if you want to make it even better, try using different voicings of the chords, as I show you in the video. You can use any voicing of the given chord. We’ll start the lesson by learning the guitar chords to She Will Be Loved. The song is in the key of Bm, and all of the chords will be in this key. We’ll be using the 7th chords, which adds a very cool, mellow touch to the chord progression. 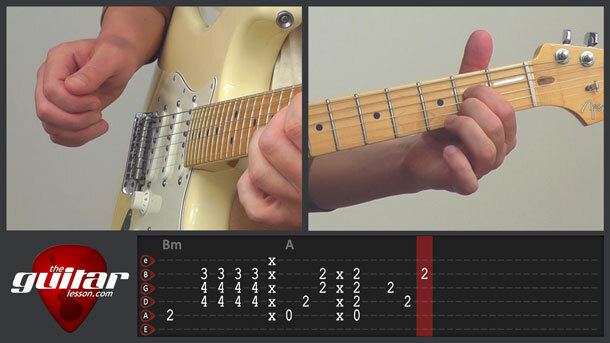 There will be 1 barre chord, but if you want, you can substitute it with a non-barre voicing. I’ll show you in the lesson. Next, we’ll learn the fingerpicking parts to the song. There are 2 main parts, the intro, and the chorus, and they repeat throughout the song. Nice and simple. You’ll use 2 chords in the intro, and apply a groovy bosa nova style picking pattern, where you’ll accent the back beats with a slap on the guitar strings. This slap will return in the chorus as well, which is just slightly more complicated than the intro. It may seem a bit complicated, but it’s really not. I’ll walk you through it all in the video tutorial. If you’re at an intermediate level, you’ll be playing this song in about an hour, it’s rather short. If you’re a beginner, the fingerstyle aspects might be a bit too much just yet, but feel free to give it a try if you like. If it’s too difficult, have a look at some easier fingerstyle lessons from TheGuitarLesson.com, and return to this one a few months later. She will be loved was released by Maroon 5 in 2004 on their debut album, Songs About Jane. She will be loved was the 3rd single from the album, noted for it’s popular music video. The song was an international hit, reaching the top of the charts in several countries around the world. Sorry, but you've reached a premium content area. The download of the She Will Be Loved tablature file is only available to premium members. Sorry, the same goes for the backing track. To download the backing track to She Will Be Loved, please log in and revisit this page.